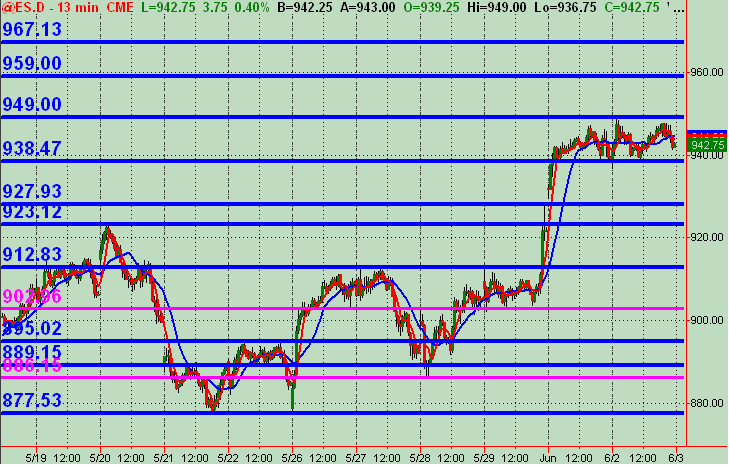 a little inverse H&S on 5min chart type pattern "look" FWIW ... with it's low end finding support on the VAL ... I still am on sidelines after the a.m. ... don't have any decent price action levels to work off of and no real feel/sense for a directional bias intraday ... though the 30/60min charts, at this point, have a toppy look to them. And with the past 2 day run-up ... the 30/60min charts might (I say "might") be working on the right shoulder of a larger time frame H&S if price rolls on over during this p.m. Just some observations. On the bigger time frame, if the ES punches thru 950 ... the next significant levels (based on fib rtc in this case) is 967 and then 975 FWIW ... I ain't a huge fib rtc fan in most cases ... but this is a little more significant on my radar. With a 60+ point run up in 4 days in a row (each closing up on the session), I'm inclined to see those levels mentioned above as an extreme resistance area ... for at least a short term "overbought" reaction. 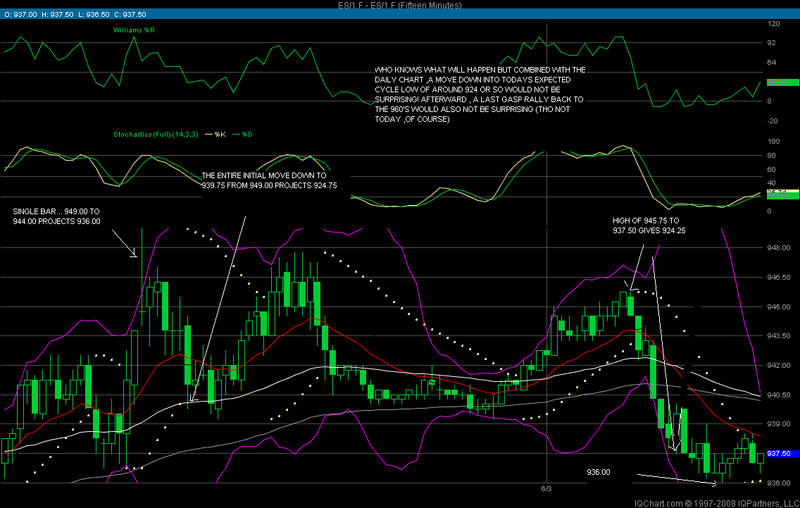 Wkly R2 is at 958.50 and also taking into account Kool's 60ish projection. The low of 4 days back was 886.25 ... and with where the mkt is trading now at near it's session high of 949 ... that's over a 7% quick increase. Food for thought I guess. 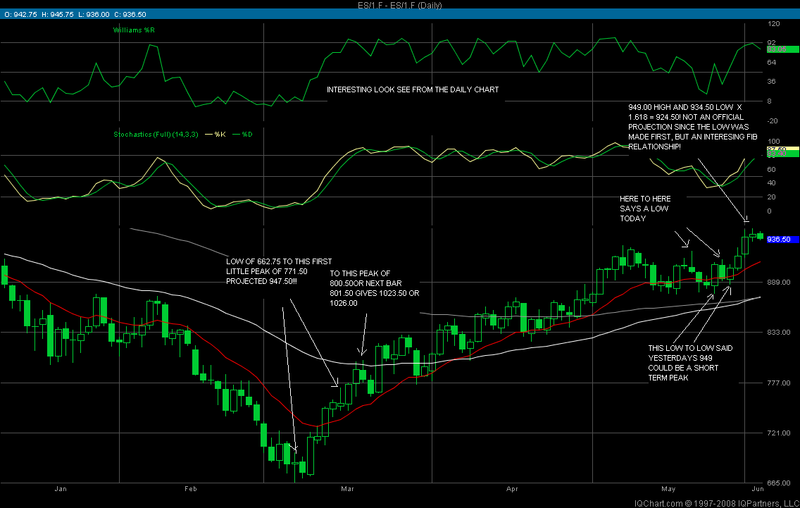 Thot I'd throw out my 13min chart "map" of Support/Resistance price action levels FWIW coming into Wednesday. Interesting 30 and 60 min charts at close of the session today. May trade tomorrow, but prob will be taking a break (vacation planned). Hope this "map" helps! As usual Bruce, feel free to kill this chart off whenever you wish, as it takes up a lot of space.